The San Antonio Spurs are the better team and the number one seed. So what? The Dallas Mavericks aren’t in the playoffs just to provide some background for a championship bid from last year’s finalists, and another outstanding performance from Monta Ellis led the Mavs to a 113-111 win and yet another game 7 in a postseason that’s breaking quite a few records in terms of first round length. But taking a more micro view on the matter, the Mavs are able to through the Spurs out of their comfort zone, especially defensively in their last two wins. Once it was a Vince Carter corner three that saved the day, and this time it happened to be Ellis being unstoppable in the open court and especially on pick & roll plays, shaking off Kawhi Leonard time after time, while Dirk Nowitzki finally found a way to handle Tiago Splitter. If the Spurs try and find one thing that went wrong for them in the game besides defense, because the Mavericks weren’t exactly getting big stops themselves, it had to be Manu Ginobili. The team’s best player through the series was limited to only 1-of-8 from the field, making bad decisions and turning the ball over 3 times in 25 minutes, playing like the guy everyone thought should retire by the end of the 2013 NBA finals. 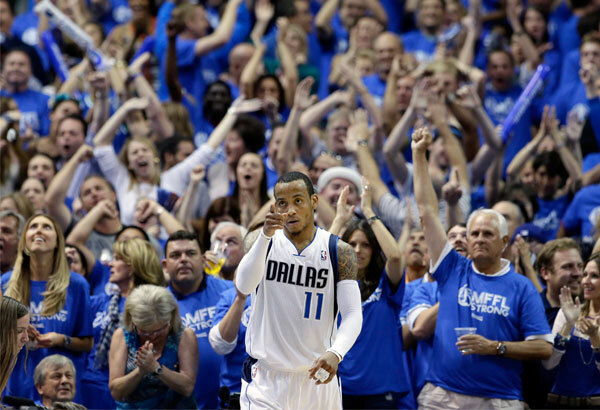 Monta Ellis led the Mavs with 29 points on 11-of-22 from the field. When he’s able to shake off Leonard’s close companionship, there isn’t a single player on the Spurs who can match his athleticism. Ellis cored 19 of his points as the pick-and-roll ball handler, making 8-of-12 on such attempts. The pick and roll was a big problem for him in previous games, hitting only 31% of the attempts as a ball handler. Dirk Nowitzki is another player who finally broke out of an issue he had. When Splitter, almost getting a fourth consecutive double double (19 points, 8 rebounds), was guarding Nowitzki in games 1 through 5, the German star was only 35.3% from the field. In game 6 Nowitzki finished with 22 points, as 12 of them came with Splitter guarding him with his usual display of unique moves with his back to the basket. DeJuan Blair returned, and it seems that playing against his former team is bringing the best out of him. He scored 10 points, added 14 rebounds and had 4 steals, with the Mavs once again getting some interior presence off their bench which was sorely missing in game 5. The Spurs allowed 50 points in the paint and not being able to handle Ellis creates too many holes for them to recover from for most of the game. Old rivals going to the limit. A #1 vs #8 series never goes the distance, but the West isn’t your usual conference this season, and the Mavs aren’t your usual number 8 seed. A hall of famer taking a step backwards so the best player in the right situation can lead the team when it matters with a combination of role players doing their job on both ends of the floor (yes, even on defense) seems to be kryptonite to a Spurs team that looked close to flawless for a huge chuck of the second season, but seems very vulnerable now.